Having a Professional Engineer’s License (or PE) tells others that you are a competent engineer of high integrity and have high ethical standards. It is important for many chemical engineers right now and could be even more critical in the future as regulations and laws governing the practice of engineering change and as the culture of chemical engineering changes. A Professional Engineer (PE) is an engineer that has been licensed by a state. The license symbolizes that the engineer has completed certain training and has demonstrated minimum competency in a field of engineering. The specific training required depends on the specific state where one seeks a licensure. In most cases this currently requires a BS from an ABET accredited engineering program, successful passing of the Fundamentals of Engineering Exam (FE), 4 years of practical experience, and passing the Principles and Practice of Engineering (PE) Exam. Why should I get a PE? Your engineering career can extend over 40-50 years and it is almost impossible to predict what you will need many decades in the future. Having a PE gives you maximum flexibility. It is generally much easier to obtain your PE early in your career while technical content is fresh in one’s mind, so why not do it? Plan for your future. In some cases only a PE may attest to certain work products. You may want to be a Private Practitioner (whether now or 20 years in the future). If so, a PE will be required to advertise or offer services to the public. All things considered, having a PE may well make you stand out from those who do not. Obtaining your PE will give you a feeling of real accomplishment. What is the process for becoming a PE? The PE Chemical exam became a computer-based format (CBT) exam in January 2018. The new computer-based PE Chemical exam allows year-round testing at approved Pearson VUE test centers. The only reference material allowed in the new CBT format is the online PE Chemical Reference Handbook. Please see more details at https://ncees.org/engineering/pe/chemical/. The PE Chemical Reference Handbook is available for download. It contains charts, formulas, tables, and other information that may help you answer questions on the PE Chemical exam. However, it does not contain all information required to answer every question; theories, conversions, formulas, and definitions that examinees are expected to know have not been included. Log into MyNCEES to download your free copy. To report errata in the PE Chemical Reference Handbook, send your corrections or comments using the chat feature on the NCEES website. How can I prepare for the PE exam? The National Council of Examiners for Engineering and Surveying (the organization that administers the exam) offers study materials. Do all states have the same requirements? Most do—in order to aid reciprocity. However, several vary from the general pattern for local reasons. State-by-state variations are possible, because licensure laws are exclusively under the control of the individual state legislatures. What if I want to be licensed in several states? 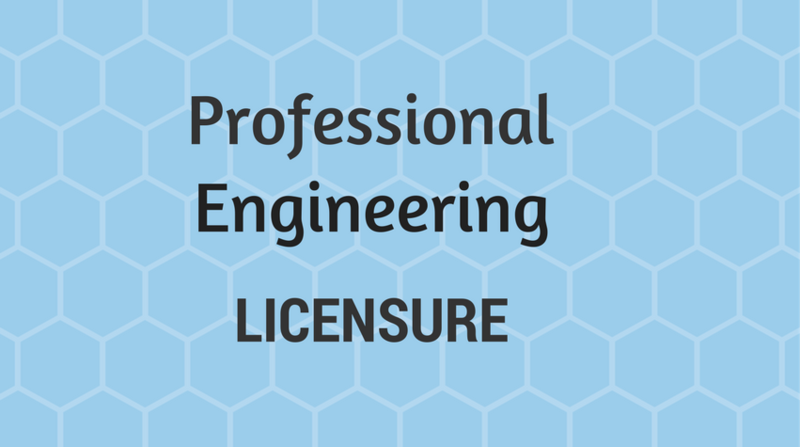 Most states allow an engineer licensed in one state to become licensed, without further examination, as long as the requirements of the state that originally granted licensure at least equal their minimum standards. The actual process, documentation, requirements, etc. can vary from state to state. How do I find out what my state's requirements for licensure are? To learn more about professional registration and Continuing Professional Competency (CPC) requirements in your state, contact your state's board of licensure. The following web sites have links to each state's board as well as other information on professional licensure. Do I have to take courses in order to renew my license? Currently, 19 states have CPC rules in effect for relicensure. Each state maintains their own requirements but they all follow the same general pattern—again for reciprocity. The general requirement is 15 professional development hours (PDHs) per year. PDHs can be acquired for several activities, including coursework. Are you a chemical engineering consultant looking to protect yourself? Reduce your risks, protect your income and assets with a solid E&O Plan. Custom written by and for Chemical Engineers and chemical professionals, this policy is underwritten by Lloyds of London. Affordable liability policies are offered to chemical engineers, chemical engineering educators, chemists, and professionals who are AIChE members. NCEES seeks volunteers to participate in content review for the PE Nuclear Survey (PE) exam. This online survey will be used to update the specifications for the Nuclear PE exam, which is required to become a licensed professional nuclear engineer. NCEES requires a cross-section of licensed professional engineers practicing nuclear engineering—including those working in industry, consulting, the public sector, and academia—to complete the survey to update specifications for the exam. The survey will help determine the knowledge and skills required of a licensed nuclear engineer with 4 to 6 years of experience to practice in a manner that safeguards the health, safety, and welfare of the public. It can be completed in about 40 minutes. The survey will open until April 10, 2019. We hope that you will help with this important study by taking the survey and encouraging fellow licensed nuclear engineers to take the survey. NCEES Chemical Engineering Reference Handbook: Requesting Your Input! Candidates preparing for the Chemical PE exam are encouraged to download a copy to study for the exam. NCEES welcomes comments and corrections to improve the quality and value of the handbook. Follow instructions to provide input.